At Northlondonosteopaths we find osteopathic inspiration from the most unlikely sources. You do not have to be a great artist to appreciate the art of anatomy. Looking at pictures of two bronze sculptures which may have been identified as original Michelangelos the beauty of the human musculature is striking. 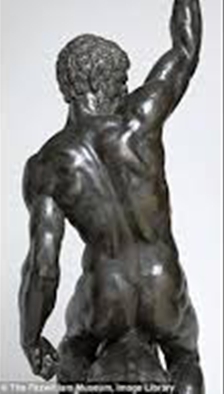 However the muscles so exquisitely chiselled in this bronze are not just wonderful to behold, but the function they perform are equally wonderous and worthy of attention. Alan Nevies and his colleagues thought that it was deserving of a blog post and with Michelangelo’s permission would like to use these two bronzes as the display models. They attach to the back of the shoulder blade as well as to the back of the collarbone. The trapezius muscle connects the spine to the upper limb and acts on the shoulder blade to achieve the following movements: elevation, depression, retraction and rotation. Clinically the trapezius is often relevant to patients having a sore neck. It is often tight due to the way people sit at their work stations with their head shifted forward looking at the screen and putting extra strain on the trapezius muscle. Next the rhomboids. The rhomboids are a pair of muscles that attach the scapula (shoulder blade) to the spine. They are responsible for pulling the scapulae towards the midline and rotation of the scapula when the arm is at its extreme range of motion. The rowing motion is achieved by the rhomboids contracting and both scapulae being brought toward the midline. Finally the deltoids. The deltoid is a powerful muscle that gives the round contour of the shoulder. It is made up of anterior, middle and posterior fibres that all act in different ways. The anterior portion helps with flexion ( raising arm straight ahead of you,) middle portion assists with abduction( raising arm to the side) and the posterior fibres extend the arm ( bring it backwards). Although it is not part of the rotator cuff the deltoid helps stabilise the shoulder joint. So enjoy the craftsmanship of the amazing sculptures and open your eyes to the beauty and functionality of the real thing. Help keep these muscles in good shape by using them correctly and at northlondonosteopaths we are happy to show you how.